Buying a home is one of the most significant purchases you will make. 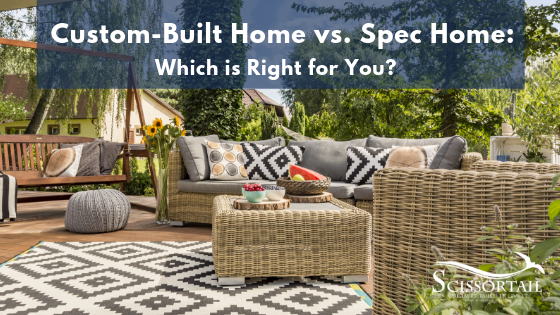 Understanding the differences between a custom-built home vs. spec home will help you decide which is right for you. What is a Custom-Built Home? Many of these items are purchased within an allowance budget, meaning the contract sets out a specific amount of money set aside for each category. It’s up to you, the buyer, to choose and purchase within that budget. While it’s true some custom homes are more custom than others; these homes commonly meet your specific needs better than the other alternatives. The term “spec home” is short for a speculative home for sale. Builders, even custom home builders, construct homes for sale with no particular buyer in mind. When shopping for spec homes, you can expect the builder to be a bit more on the conservative and build a house they think will appeal to a wide range of potential buyers. Experienced builders will understand their market and what people want in a home. Spec homes are often fully completed. However, depending on how far along the building process is, it’s still possible to make some selections such as paint colors, tile, countertops, and more in a spec home. Are you looking for new homes for sale near me or new construction homes in Bentonville, AR? Visit Scissortail and experience our beautiful properties and luxury lifestyle. Check out our many amenities. We have several lots for sale or tour one of our spec homes constructed by our exclusive custom home builders. It’s time for you to Dream It, Built It, Live It in Scissortail. Did you find this article helpful? Share it and sign up for our newsletter twice a month and stay up-to-date on home building and life in Northwest Arkansas. Scissortail kids attend one of the best school districts in the nation. NEXT TIME, we’ll share all about what makes buying a home in the Bentonville School District is an excellent investment in your children’s future.